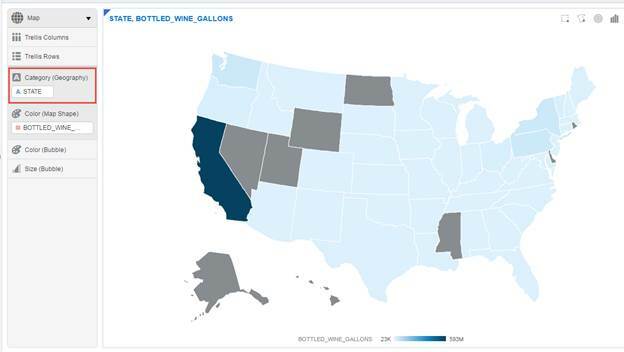 Since I’m heading out on long weekend of winery visits and a half marathon this weekend in NorCal, I thought learning how to use the Maps visualization in Data Visualization Desktop (DVD) would be a good compliment to planning the winery route. Luckily for us, there was no need to add in map layers to a BI project, rather it is already built into DVD. 1. I created my desired winery list and used the following website to get the latitude and longitude of the winery addresses. 2. 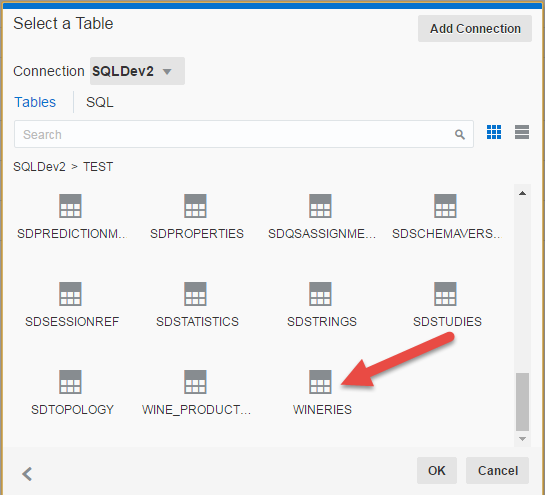 I created a table called “WINERIES” in my Oracle 12c database. 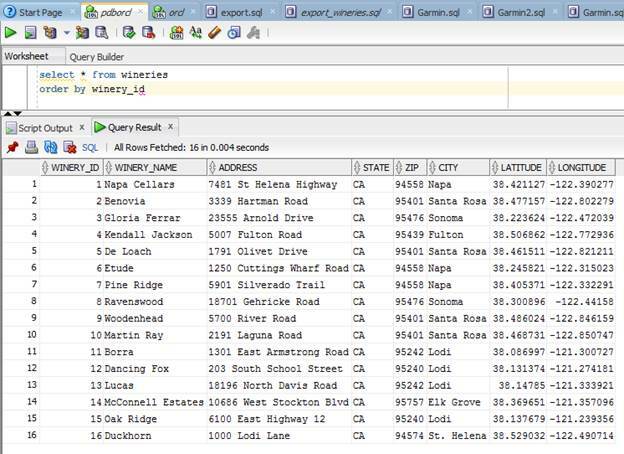 SQLDev helps show how I set up my table. 4. 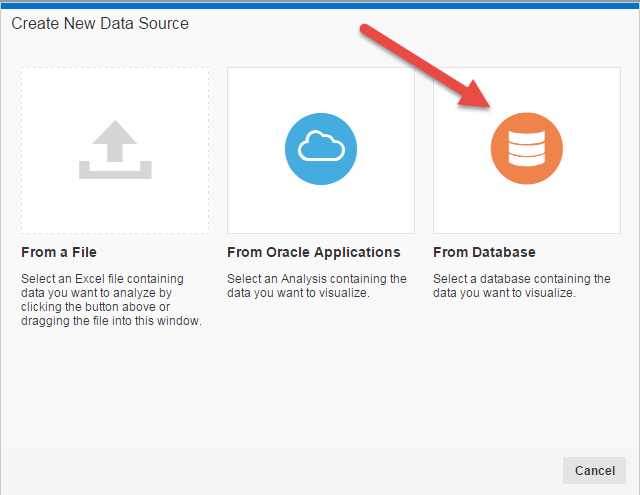 In DVD, click on Data Sources to add our new table. 5. 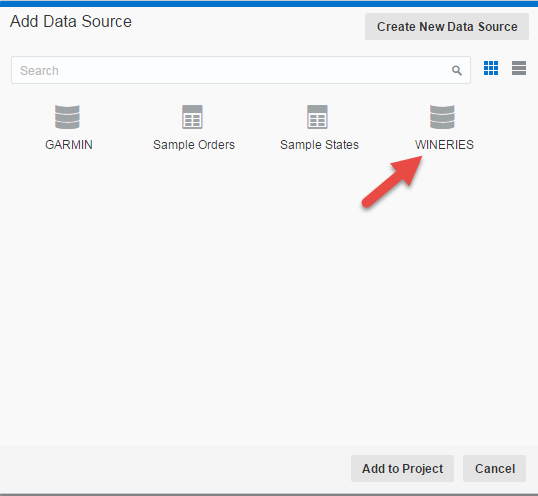 Click “Create New Data Source”. 7. Select the WINERIES table. 8. Make sure the table column settings are correct. 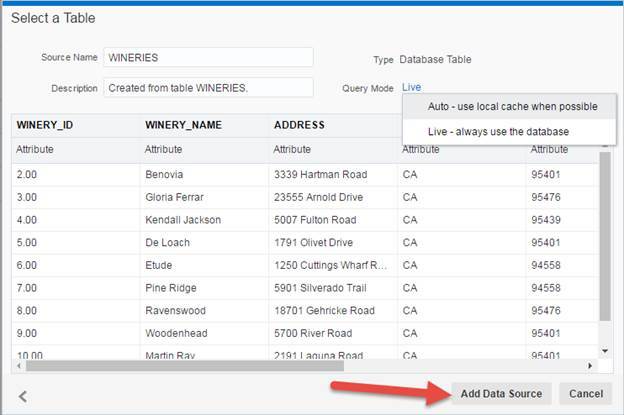 I highlight the Query Mode below to show that you can choose Auto or Live. We will use Live. Note that the Latitude and Longitude columns need to be set to “Attribute” to have the ability to map. 9. 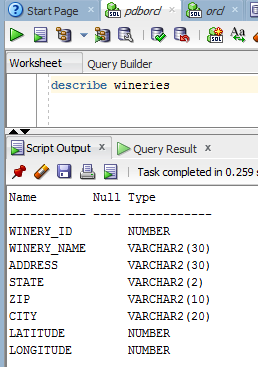 We now see the new WINERIES data source. 10. 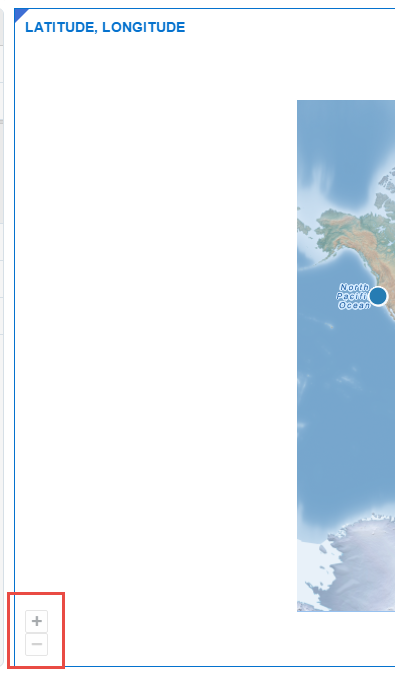 Now, click on Visual Analyzer to start our map. 11. Choose WINERIES as our source. 12. 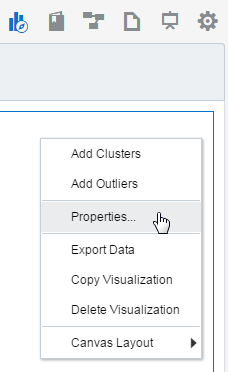 From the graph options, choose “Map”. 13. In the “Category (Geography)” section, add Latitude and Longitude. We can see our items are on the map. 14. I don’t feel this graph is helpful for my needs, so I’m going to change it. Click on the gear button in the graph (not DVD settings) and choose Properties. 15. 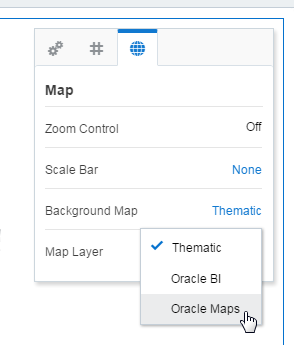 Select “Oracle Maps” as this will give us roads, cities, and geographical features. 16. We get the map we want, but it’s not zoomed in enough to make it useful. 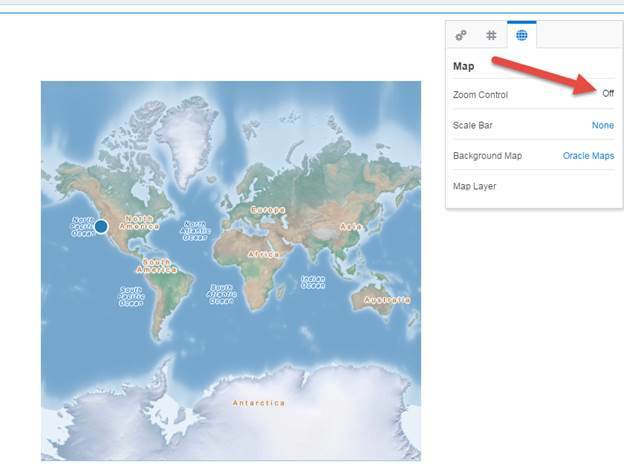 To add the ability to zoom, click the Maps property button and set “Zoom Control” to On. 17. We can now see the zoom buttons are added. 18. 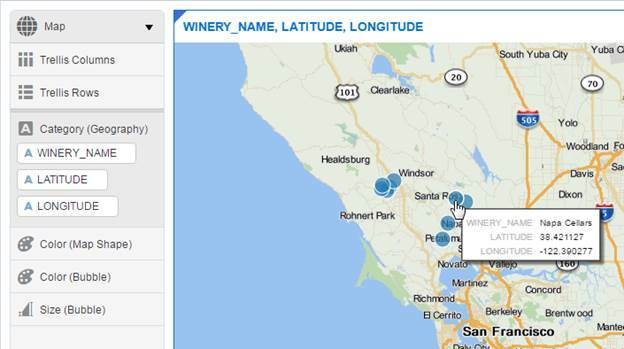 I added WINERY_NAME to my list and now I see my wineries plotted with the name. Perfect! 19. 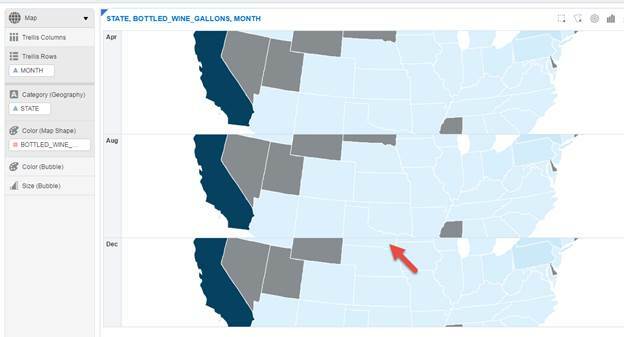 Say I wanted to map bottled wine gallons by state. Again, I don’t need to do anything special except choose the table columns. 20. Once I switch the graph to a Map, it’s automatically created for me. 21. 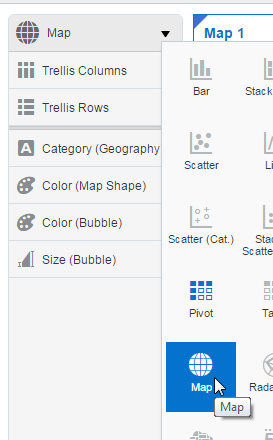 Just for fun, I added MONTH as a row trellis to show the map changes. See December…Montana has values where as it did not in April or August. I was able to create each of these maps in a matter of seconds or minutes. There are more options you can choose, but this functionality is out of the box. Easy enough!